When I first started crocheting last year, I had these fantasies of whipping up beautiful home decor items: throws for my couch, pillow covers, etc. etc. in a matter of weeks. 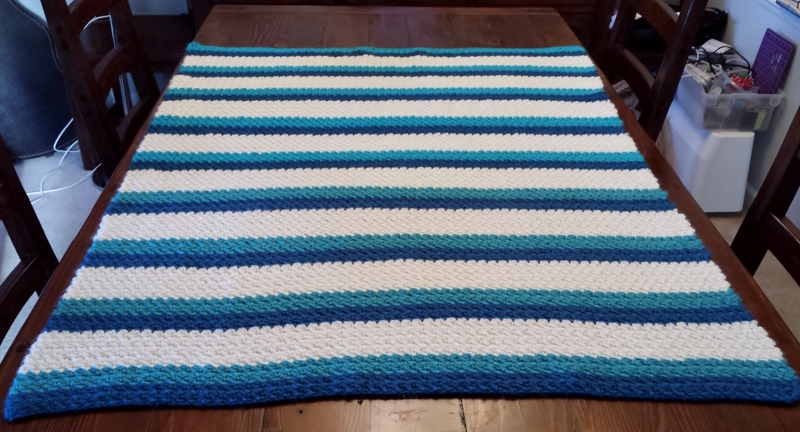 I started with a relatively simple free pattern found on LittleMonkeysCrochet (Sweet Ocean Breeze Baby Blanket), changed the number of stitches to suit the size I needed and away I went. Ha! I laugh at myself now. The thing is, crocheting a blanket with a single strand of worsted weight yarn using an I hook takes what seems like FOREVER!!! I began this blanket in March 2015 and my goal was to have it finish before March 2016. I just wove the final end this morning – Hazaa!!! The finished product! So warm and cozy! Now in fairness to me ;-), I’ve completed a ton of other projects over the past year, but this blanket just kept on going. As an aside, if you follow my blog, you’ll know that I started my first knit sweater this January. I ran into a snag with some dropped stitches and had to put it down out of pure frustration, which led to the accelerated finish of the endless blanket. Now that I’m done, with a sense of accomplishment and feeling renewed confidence, I will pick up the needles once more to resume work on the shrug! Back to the blanket, the highlight for me making this blanket was that repetition = excellence. 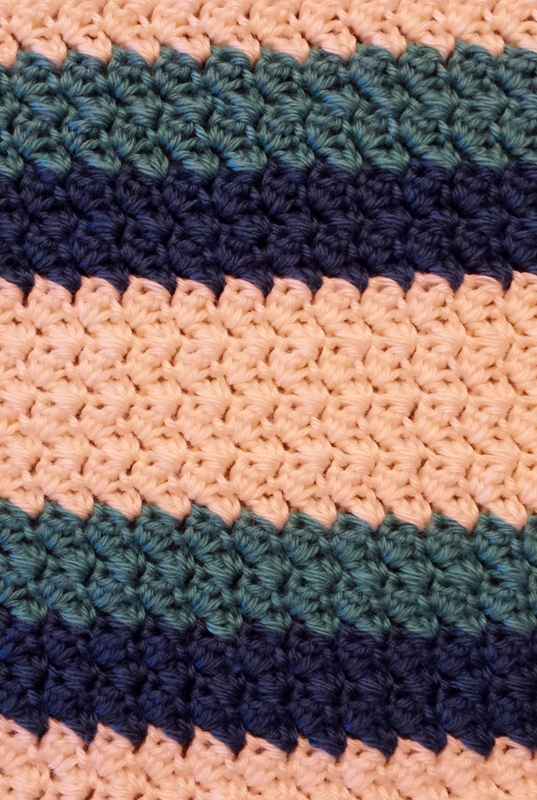 The longer I worked on this stitch combination and the colour changes, the better my stitches looked, with improved tension consistency, and my colour changes look pretty darn seamless. Yes, I’ll pat myself on the back for this one. The downside, as you’ve already picked up on, is boredom. Thank goodness I like to have a few projects going at a time to switch things up. Stitch detail – simple and so pretty! As mentioned above, you can find the base idea for the pattern from LittleMonkeysCrochet. I just made it bigger and used Caron Simply Soft yarn (worsted; 4) rather than Bernat Satin – only because in Vancouver, Caron Simply Soft is well stocked at Michaels in a wide range of colours. For whatever reason, Bernat Satin is only carried by Walmart (as far as I can find) and not the greatest colour selection. Well, that’s it for now…back to the shrug I go! Only now, I have a fantastic lap blanket to keep me extra warm.